pocket. They moved to The Woods in 1950. The Rogers had three children, Greg, Gain and Galen. After driving around Ashgrove, (where their brother lived), looking for land, they then drove into The Woods and knew this is where we wanted to live. Surrounded on three sides by the creek and on the other side by the hill, it was ideal. Their initial thought of St. John’s Wood was that it was new, clean, had no through traffic. No noise, no nothing. Also handy to the Ashgrove State School, the Good Shepherd Anglican Church, which was then situated on Waterworks Road where the Baptist Church is now located. They took the kids to Sunday School there. They bought the land at 54 St. John’s Avenue from Mr. Johnstone, who was the sub-agent for the landowner. He showed us the block and originally we were not happy with the aspect. The yard sloped downwards at the back of the property. They kept it on “speck” for a week to see if a better block was available. Asking price was 75 pounds. They decided to buy the land as the outlook was good and there were no other houses on the other side of St. John’s Avenue and thought there would be none built in the future either, as the land was very steep, and sloping down to the creek. It was pretty obvious that The Woods had everything going for it, with the bush up there (the hill) and the open area in the front and subsequently we had all the flora and fauna. It was like living out in Thargomindah. Our house was built with war-service finance, which only allowed for a house the size of 2 ½ squares, as materials were scarce after the war. The patio and concreted areas under the house were included in the 2 ½ square allowance. War service loan was at 3.75%. We were laughing! We found our own builder and moved in October, 1950. And we found the Woods, before the millionaires did! Three houses across the street were built some eight (8) years after we finished ours. To visit our family at New Farm, we put the kids in the prams and walked up to the West Ashgrove Tram Terminus and caught the tram. A builder, Mr Hodges came up from Sydney and built the houses on the creek side. He was a good builder. The Duvals moved into one of the houses. Margaret married a French man and they started a French School in George Street in the city. The Hassels, two spinster sisters, who came from Beaudesert, came before the Duvals. Doug McKenzie and his wife, Masie also moved into the Woods. He was a minister in the Presbyterian Church. They did a lot of missionary work in the Pacific Islands and outback Australia. The retired and moved up to Caloundra. Ray Ososki at 50 St. John’s Avenue had a Polish background. He would catch and eat the 60cm long eels that he caught in the creek. We associated with ex forces families that lived in the Woods. Jim Tweedale, (ex-Navy), lived a couple of doors down from us. Bill Taylor (ex-Navy) and wife, Gloria, lived on the creek side of St. John’s Avenue at the bottom of the hill. The Smalls lived next door to the Taylors. Merv Burdett (Air force) and his wife Nola lived at 58 St. John’s Avenue. 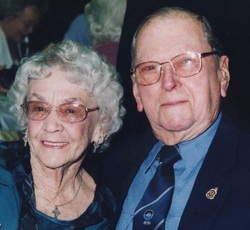 Eric Finlayson (POW & ex-Army) and his wife Iris lived up the road. Col (ex-Army) and Wanda Swan lived in Buckingham Street. Wanda Swan owned the house that has been demolished, where they put that new monstrosity over there. The milk and fruit were delivered. At the West Ashgrove was“Frank’s Fruit Shop”, he delivered the fruit. We walked everywhere before we had a car. Before Norma and Eugene Franklin owned the shop at the bottom of St. John’s Avenue, the Lindsay family owned it. It was opposite Laird Street. Their house was behind the shop. All the local kids would go there for ice cream and soft drinks. There was a picture theatre, called the “Elita” on the corner of Stewart and Waterworks Roads. We got there by tram. The three tennis courts in Royal Parade were well used. Mixed players on Friday nights and the ladies would play during the week. We had our own neighbour social club. We would go down to the park for a picnic. You had to bring your own cups and saucers in a big box. In the 1960’s, we went to dances at the Ashgrove Bowls Club with Bill and Gloria Taylor. The ladies tiptoed across the creek in their high-heeled shoes and best dress. When the footbridge was completed across the creek, the GPS Park became very popular with the kids and their bikes. For Christmas and New Year we went down to the Taylor’s place for a BBQ, because Bill was a brickie and he had a wonderful big, brick ‘barbie’. We celebrated with a few drinks and some games. Time meant nothing to us in those days. The ladies played “Canasta” and the mixed groups played “500”. The neighbour social club including ourselves, consisted of the Taylor, Burke (Ricky (wife) and Max), Hollywood (Geoff and Jean), Draffin (Steve (wife) and Merv), Small and Tweedale families all lived in St. John’s Avenue, the McTernans on the corner of St. John’s Avenue and Laird Street and the Juppenplatz (Noel) and Swan families in Buckingham Street. Not many people had cars, so we all used the tram and buses to get to work and that is how we got to know everybody. After work, some of us would meet at the Embassy Hotel for a couple of beers and then go like mad to catch the last bus to the Woods at 6PM. People with cars would take people walking to the tram terminus either to the terminus or if they were going to the city to work, they would drop them off in the city. Walking around the Woods these days, the younger people do not say “Good-day” when we pass them in the street. Things are a lot different now, than in the olden days. These days, if you ask people walking if they want a lift, most of them say “no”. One of the biggest challenges of living in the Woods was the flood in 1974. When the water started going over the top of the bridge, I would put on my raincoat, then take off my shoes and trousers and put them in my briefcase and wade across the bridge. At times, it got to knee height. The wildlife was plentiful. There were possums, crested hawks, swallows, peewees, kookaburras, pheasant coucals, parrots and snakes. After rain little mounds of mud would appear in the backyard and I couldn’t figure out what they were, until one day I saw a kookaburra fly down onto one of the mounds and pulled out a little green, fresh water ‘yabbie’. The creek was a favourite with the kids, as they could net rainbow fish and feed the eels and catfish. They would cut the bamboo and make it into bows and arrows. One of the good memories is of kids racing their trollies down St. John’s Avenue. There would be a traffic lookout kid at the bottom of the hill letting those at the top know about any cars that were approaching. I put a metal hinge on the bottom of the trolly brake and sparks would fly when they put on the brake. When the kids got older, they went to riding their bikes. At the western end of Royal Parade there was an old pistol range (in the old quarry) and my son would collect the lead bullets and make fishing sinkers from them. The kids would go to the rubbish dump on Monoplane Street and bring back all sorts of things.